Even though most of us are still having those, “I can’t believe it’s already SUMMER” conversations, in the world of publicity and media, we’re quickly approaching another season: Christmas in July! What does this mean? In short: You are not on summer vacation from media outreach, my friends! Instead, any of you who would like to find your business, products, or expert tips in the holiday issues of magazines, from Redbook to Real Simple, Oprah Magazine to Southern Living, Shape to Parents, THE TIME IS NOW TO PREPARE! 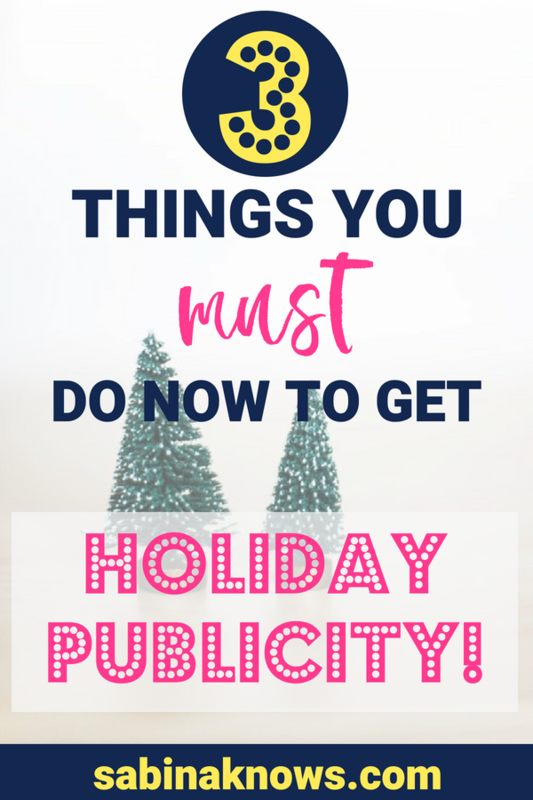 To ensure you can do your PR Prep work now, so that you can execute like a confident and strategic PR rockstar later, I’ve made you a handy Holiday PR Prep List to get you started. Read it through, and be sure you’re in our Press for Success Facebook Group to catch the live Q & A’s I’ll be doing there – and several other success-boosting opportunities along with it – beginning next week! ARE YOU A PRODUCT MAKER? What products will your business be offering for holiday gift guides? NO, “all of them” isn’t an option, unless you are a business of only a few offerings. What do you need to prepare before you pitch them (photos on a white background? Website updates? Get on it! Remember, product offerings extend beyond gift guides! Other common categories include holiday party style, holiday beauty and styling tips, holiday stress relieving products, holiday entertaining must-haves, hostess presents, and more! I’ll teach you how to prepare for these possibilities in the next tip. ARE YOU AN EXPERT OR SERVICE PROVIDER? What expert tips related to all things holiday, and New Year, can you share as an expert or service provider? Remember this can range from fitness tips to financial expertise, party planning to gift-wrapping to advice on dealing with family disagreements and stress around the holidays. Heck, a heating and cooling company could even give tips on keeping your heating bills low during the cold winter months. The key will simply be matching your tips to an audience that will find it valuable. Begin by asking yourself “What seasonal insight do I have to share?” “What can I teach people that would make their holiday better, happier, healthier, less expensive, more stylish…” Once you start brainstorming these tips and “listicles”, begin expanding on them in a Google Doc so you can keep your ideas safe and sound! Remember, you may have more than one – even more than three – different offerings of expertise and tips, as you may be pitching different audiences. For example, what you choose to pitch to a business magazine will differ from what you pitch to a parenting magazine, which will again be quite different from how and what you may have to offer to a women’s lifestyle magazine! That’s why we prepare now: so you have ample time – more than a month – to get these items together. When you plan in advance, the work can actually be pleasurable! This will allow you to prepare any corresponding materials (product PDF’s, Pinterest Boards, custom line sheets, you name it!) that will visually share what you have to offer, making you even more irresistible to the press. Remember, a picture speaks a thousand words! One of the most powerful, yet least often used tools in your PR Tool Box is – and it’s FREE for the most part – is your ability to research how the monthly magazines you’re targeting have covered holiday-themed stories in the past. Whether you want to pitch gift-guides or your expertise, it’s imperative that you check out past – and recent issues before you put pen to paper (or finger to keyboard) to create a pitch. Look at how the specific magazine you’re reaching out to has covered the type of holiday story you’re hoping to be a part of, in their past issues. Often you can find these both online (as print coverage often finds its way online as well), as well as by looking at past issues of the actual magazine. It’s important that get a feel for how they cover everything from their gift giving suggestions to the types of holiday-focused expert advice they’ve shared in the past. Examining these like a PR researcher will quickly show you that no two magazines are the same, from fashion magazines to parenting outlets! Not sure how to look at past magazine issues without becoming a straight up PR archaeologist, finding a relative who collects old magazines, or diving into old library archives? I HAVE YOUR ANSWER! My friends, the fastest and easiest way to see the past couple years of magazine issues (including their HOLIDAY editions) is TEXTURE. If you’ve ever been on a Facebook Live chat with me recently you’ve heard me rave about this app (and no, I’m not being paid to love it). Texture brings magazines to your fingertips – as in your smartphone or iPad. You can literally flip through countless magazines (including years of past issues) from the comfort of your own desk or couch. Even better? You can sign up for a free month (just in time for research) and after that, it’s only $9.99 a month – which is legit less than some of the “fancier” magazines I discover at Whole Foods cost these days. Before pitching holiday stories – or ANY type of story to a magazine, it’s also imperative that you dive into a couple of more recent issues as well. Why would you do this? Especially when past issues are all about spring and summer? I want you to be familiar with a few key items including the outlet’s tone, voice, style, layout, monthly columns, and how they deliver information from your niche and industry. I feel like a broken record when I say this, but I’ll say it again anyway: Just because you glanced at O, the Oprah Magazine or Men’s Health while at a doctor’s appointment last month, doesn’t mean you’ve researched it. I’m not asking you to study it like you’re preparing for a term paper or thesis, but I am saying that dedicated time examining the magazines you want to land a feature in will deliver a WEALTH of information to you. You’ll find new columns you didn’t know you could pitch your business into! You’ll see the names of the editors and reporters covering your beat! You’ll get to know how they speak to their audience so you can customize your pitches, outreach, and offerings to fit this style and tone. Trust me – when and if you do this, you’ll thank me! Now speaking of these magazines you’re researching…. As you’re researching and identifying the magazines locally, regionally, and nationally, that you want to reach out to this summer (for their holiday issues that is), you need a “home” for all of the information you’ll begin to gather from your work. Friends, Post-it notes around your desk and scribbles on random pieces of paper do not count. Endless notes in different Google Docs do not either. THINK BIG! TAKE CHANCES! DON’T UNDERVALUE YOUR BUSINESS, EXPERTISE, OR PRODUCTS! That was me exclaiming this as to you with passion and sincerity! One of the biggest mistakes I see entrepreneurs, experts, authors, and small biz owners make isn’t strategy related. Oh no, it’s that they simply do not even try to share their story, business, expertise or products in national magazines. As my mom (and most beloved mentor) says, “If you can draw a small circle, you can draw a big circle.” If you’re going to pitch a local, regional, or trade magazine, why not send that same holiday pitch – with a few tweaks of course – to a national magazine? Often, the only reason why not is rooted in self-doubt or fear, and you deserve better than letting those pesky yet powerful mental roadblocks stop you! Trying is FREE, trying isn’t punished, going for the big asks gets you the big publicity and the big sales! If you’re a student of my Press for Success PR Masterclass (a must for any business wanting to excel at their public relations) you can download a digital “PR Home Base” directly from the course. Check and check! I did the work for you! If you are not a student a) what are you waiting for? and b) until you join us, you’ll have to make your own PR Home Base spreadsheet. Trust me, if you don’t make a space to house everything from contacts to research notes in a tidy, inviting way, you’ll spend way too much time trying to track email addresses and other vital information. Begin by writing down the titles of the magazines you want to be in, don’t worry about the “who” just yet, or don’t let the unknown of “who” stop you. I’ll have plenty of posts, InstaStories, Facebook Lives, and classes that will help you figure that out in due time, but you must first figure out the “WHERE” in terms of the magazine. Another quick note on the who: In terms of the WHO, every outlet will be different in terms of the WHO covering the story. For instance, in some places it may be an official Gift Guide Editor, in others, it will be the editor who covers your niche or industry, and others may have someone completely different, and I’ll be teaching you how to ask for this information later this month. Want to begin flexing your media relationship building muscles? I’ve got a FREE class you can watch on that anytime – check it out here. It’s my hope that this quick list – okay, perhaps not quick, but thorough and fluff-free – has inspired you to begin taking the steps to prepare for “celebrating” winter holidays in July. I want you to realize that public relations – no matter what type of outreach you’re working on – doesn’t have to be daunting or overwhelming. In fact, though nothing in PR is guaranteed (it’s not paid advertising, after all) very often when you follow the steps and learn the correct formulas, A + B will eventually lead to C. And “C” can be anything from creating and nurturing powerful relationships with your target press to the actual publicity. Do you need strategic clarity when it comes to PR for holiday press and beyond, along with a healthy dose of “you can do it, and I’ve got your back” confidence, accountability, and encouragement? Do you want to see the same success countless students of mine see WEEKLY (from Oprah Magazine to the Today Show to blogs and local press)? START HERE: Pop into my free Press for Success Facebook community, where over 600 small biz owners, entrepreneurs, authors and experts are sharing tips, advice, and encouragement. This is the place to be on Facebook if you’re serious about building visibility and awareness for your business, and having a heck of a good time while doing it! Take me to the Facebook Community! ONGOING EDUCATION, LIVE SUPPORT, & ACCOUNTABILITY: Join my stacked-with-benefits monthly Press for Success All-Access Membership. From courses of the month (including a new Holiday Publicity Guide + Email and Pitch Scripts), ongoing “How to Pitch Me” interviews with the media, PR Opportunities, weekly video challenges, and more. All for under 40 bucks a month – #steal! Tell me more about All-Access! THE COURSE YOU CAN’T DO WITHOUT: Whether you’re starting from square one (with no PR experience) or you’ve been doing your own PR work for years but could use some clear “how to’s” in terms of writing the perfect pitch, building media relationships , creating a campaign plan – all the parts of your PR Foundation you must have, be sure you grab my self-guided, video Press for Success PR Masterclass – complete with over 10 pitch email scripts, monthly live support sessions and more! Give me lifetime access to the PR Masterclass!